I am sitting in my favorite cafe with WiFi in the Gemmayze district of Beirut called Spin Out. The Middle East didn’t work out the way I had hoped but I am flexible with my plans so I will survive. The denial of a visa on arrival at the Syrian border was always a possibility and my back up plan was Jordan, Egypt and possibly Sudan. Even with the problems in Cairo right now, I was still considering flying to Jordan and going overland to Egypt in hopes that the crisis would be over. It looks like things are getting worse in Egypt and the entire Middle East is tense right now. Lebanon has been fantastic. My plan was to spend two nights in Beirut and then move on to Syria. That plan changed when I met some really cool people at the hostel and decided to hang out longer. I’ve made very good friends and shared some pretty unique experiences. I watched the World Championship final of handball at an Irish Pub with my Danish friend, Mette, whose passion for the sport reminded me of home for awhile. Me, and now life long Italian amico, Tommy had an amazing night out with a few Lebanese girls who took us to an underground jazz club that was doing a show for Egypt. I raided the temples of Balbeek with Sharni and had enlightening conversations with locals throughout my stay here. I’m a regular at the lounge I write this from and have been treated like family just about everywhere I go. Forget everything and anything you may have previously understood about the once troubled country and give it a chance. There is so much to do in Beirut and even more to do in the countryside. It is a culinary goldmine and a mixture of European and Middle East. French, Arabic and English are widely spoken and most people are eager to teach Arabic if you ask and sometimes if you don’t ask. Lebanese are incredibly passionate about politics and life. When I first arrived it was suggested to me that I shouldn’t tell too many people that I’m American. While I certainly don’t go around flaunting my nationality, screaming red, white and blue through the streets, I never lie about where I come from. The rewards of being truthful far outweigh any potential trouble. I have heard extremely honest and often brutally honest feelings that many Lebanese have towards the United States. I’ve gained a perspective, that without travel, would be nearly impossible to obtain. Having someone look me directly in the eye and tell me that they have a deep hatred for the U.S. government that permeates through them on a daily basis, while simultaneously offering their warm welcome to Lebanon, is an understandable contradiction. These are not just individuals who just say they dislike the U.S. because of some trite cliche. This is real life where neighbors, friends and family have had homes destroyed and lives ruined by policies put in place by the U.S. and Israel. Regardless of what side of the Israeli-Palestinian conflict people support, the people are effected the most, as is with any conflict. The Lebanese I have met say they all want peace but the political actors involved, including Hezbollah, Hamas, Israel and the U.S. all look for continued instability. The tanks in the street and the increased police presence may make a traveler feel uneasy but for Lebanese, it is comforting. Lebanon was in the news when I first arrived because of the “Day of Rage” after President Hariri stepped down due to opposition pressure. The media reported it as if the streets were about to be paved with blood. In talking to a Lebanese girl last night, I was told that the peaceful demonstrations and “Day of Rage” last Tuesday was about showing respect for the President who was stepping down and giving him some sort of dignity. 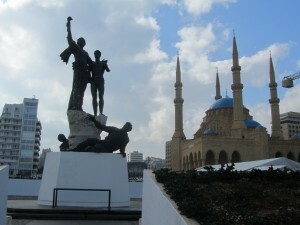 This has been an educational stay in Lebanon as well as a fun one but I must move on. I’ll wait here at Spin Out for my taxi to the airport a little later this afternoon. I will be en route to Singapore this evening with a connection in Doha, Qatar. I arrive in Singapore Friday afternoon at 3pm and will be spending the weekend with a friend from home. I’m heading to South East Asia sooner than expected. Next week I will get to Kuala Lumpur and try to get a visa for travel to Myanmar (also referred to as Burma). Myanmar is an oppressive and secretive regime and travel there can be difficult not just for Americans but all nationals. The updating on the blog over the next couple of weeks may not be all that much since I’ve already been through Singapore and Malaysia and don’t expect to write a lot about my experiences there again. I’ll probably catch up on some things I missed a long the way and write about Baalbek, Byblos and Las Geel in Somaliland. I still need to post what I’ve written about the Somaliland people as well. Amid several warnings from the manager at the hotel and other locals I decided to take my chances at the border, obtaining a visa on arrival for Syria. The official rule is that if you have an embassy in your home country then you must apply in advance for a visa and have one in hand before you attempt to cross. The unofficial rule is that sometimes they grow a heart and let travelers through at the border. The further difficulty is holding a U.S. passport and attempting a brisk walk through immigration as U.S.-Syrian relations are uneasy at best. The only way to find out if you can make it through is by trying. The good thing is that the road to the border from Beirut is only about an hour, so at worst I was going to lose half a day and a minimal amount of money. does’t matter who you talk to, people rave about it. Whether it is the people, the culture, the ruins or any other aspect of country, every traveler I met that was coming from Syria swears by it. Some have gone as far as to say that it is one of the most interesting and enriching countries they’ve ever visited. So, as you can see, I was determined to try. I headed down to the Charles Helou bus station a few blocks from my hotel. I hired a service taxi to take me to the border. He said that he would take $14 if I got turned around at the border and $20 if I made it all the way to Damascus. We headed off at around 1pm. We arrived at the border in an hour and a half. We would have made better time but the driver stopped several times to try to find other passengers. I was OK with this because the trip all the way to the border and on to Damascus uses up a lot of fuel and he does need to make money. I arrived at the border at around 2:30pm. I stamped out of Lebanon and was told by the immigration official that I would not be permitted into Syria. I said that I was going to try anyway and he told me that he would see me back here shortly. I said, Inshallah, you will not. We drove for a few minutes on the road that leads to the Syrian immigration office. At this point I wanted to approach the counter by myself but my taxi driver was trying to be very helpful in getting me through. From the first window I was directed to two other windows before finally arriving at the foreign arrivals booth. I handed him my passport and the taxi driver said something to him in Arabic. The immigration agent immediately looked at me and said, “No!” My taxi driver said something else in Arabic, probably trying to plea with him and the answer continued to be, “No!” The driver looked at me and said, “No… finished.” I thanked him for his assistance and walked outside to the car to get my bags out. He offered to drive me back to the Lebanese border but I insisted that I try one more time without him. I went back inside and to another counter and I opened with, “Aselam aleykum, can I please have a visa? I am a student and a tourist and I would just like to see the country.” The reply instantaneously was, “No! You must have visa before.” I pleaded with him to at least consider it. Then he asked for my passport and began looking through it. Whether or not I was getting through the border my passport was going to be scrutinized. Syria, much like the rest of the Arab world will not allow travelers in the country who have ever been to Israel. And it isn’t just if you’ve been to Israel but if there is even evidence that you MAY have. This means, entry stamps to Egypt and Jordan and other surrounding countries could potentially tip the agent off that you were in Israel. The immigration agent walked over to a phone at the next desk and picked it up. He said a few things in Arabic and motioned for me to come around to the other side. I followed him around to the very end of the row of booths and he came out to meet me. He asked me to follow him. He led me into the office of the head immigration officer. He was the boss and the man in uniform. My heart was pounding. I had been at least granted a conversation with the man in charge. I had gotten through two very firm no’s and had an opportunity to plead my case to the man who has the ability to stamp my passport and permit me into Syria. This was my chance. I had rehearsed in my head what I might say to an agent but I never really expected to be in this specific situation. At this point I’m not even considering offering a bribe. Bribes seem to work in underdeveloped countries with corrupt police force but Syria is a proud and modern state and this could only get me into trouble. I once again I thanked him and just as I was about to pull my bags up he asked to see my passport. He started flipping through it and asked me about my travels. He was concerned that I had so many stamps on my passport and I said I was a student. He handed the passport to one of the agents who walked off. The officer told me to have a seat and that it would be a few minutes. At this point, I’m thinking to myself that I got through and that my perseverance paid off. The officer further questioned me about money and how I was able to travel to all these places. I told him I have a passion for travel and that I did work for a long time to save up money to do these things. I told him I write as well. I didn’t want to get too into my writing because I didn’t want him to think I was a journalist. He was also concerned about my age and said I seemed too old to be a student. The other agent came back in with my passport and handed it to the man in charge. He looks through it again and asks me if I’ve ever been to other countries in Arabia. I told him, not aside from Lebanon. I had forgotten I just passed through Dubai on a layover so he pointed that out to me. I thought the next words out of his mouth were going to be what I’ve been waiting for. However, it was not. He told me to go outside and head towards the duty free shop where I would find a shared taxi to take me back to the Lebanese border. I tried. I was happy with my effort. I would have been disappointed to have left Lebanon without trying just because some people said it would not work. It hit me pretty hard as I walked out of Syrian immigration. I had been so close and was denied entry. It was like a kick to the stomach. I was about two hours outside of Damascus, one of the oldest and most interesting cities in world. I was so close to the land of Saladin and the Ayyubid Dynasty as well as the ancient cities of Palmyra and Allepo. Only to be turned around at the border. I enjoyed the attempt though and would have done it again. In the end, I think my story didn’t quite hold up. My age didn’t match up with my occupation. I should have been a little more honest and said I had recently left work to travel after having a job with a bank for ten years. The trip back to Beirut was an adventure itself. The one piece of advice I would give to any other travelers attempting the crossing without a visa, is to do it earlier in the day. The sun was already setting as I left Lebanon and it was impossible to find a shared taxi back to Beirut. I ended up contracting a taxi on my own and the asking price was $50. I got him down to $30 after a long process of communicating in broken English and no Arabic. He was a young and energetic driver who lived in the countryside. He begged that I pay him more because the cost for fuel ate up most of the money that I was paying him and he was only left with $10. We meandered around corners, up and down hills with the rain still falling pretty hard. We came around one corner where we were met with brake lights and traffic stopped dead in its tracks. There was an ocean of water building up on the right side of the road. Some vans and cars had already been flooded out and were causing a massive jam. There was a small narrow strip in the far left lane that was shallow enough to pass so the driver waited for the best opportunity and passed. The water was so deep that even a bus had gotten stuck. We made it through and eventually we were well on our way back to Beirut. 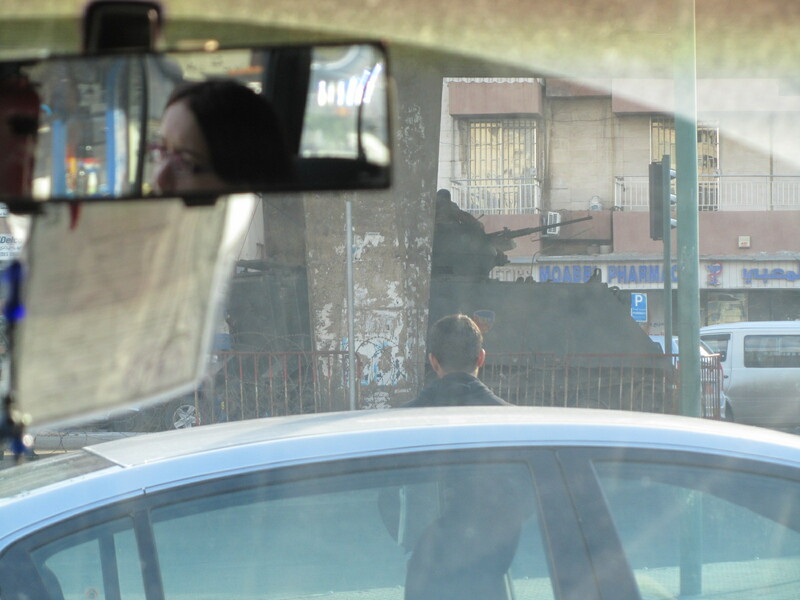 The drive was dangerous and the driver seemed stressed out about having to stay in Beirut. He jokingly said, “You go to Beirut, I want to go see my mama and papa, but I stay in Beirut in my car.” I decided that when we arrived in Beirut at my hotel, that I would give him the original $50. He was very thankful and brought me right to my front door step. My Middle East adventure isn’t working out the way I expected. My plan was to overland through Lebanon, Syria, Jordan and then finish out with Egypt. If Syria was not going to work, which I planned for, I figured I’d just end up in Cairo. With Cairo having problems, that is out of the question now. I don’t want to fly to Jordan just to fly back out. So, that leaves me wide open to figure out a new plan. I currently have two destinations in the works. Both are countries that I have not previously talked about and both are on complete opposite ends of the travel spectrum. I’ll wait to spill the beans later but either one I choose should be interesting in their own way. I’m just working out the flight details now! How all of political issues and the U.S. response directly effects my travel is more about frustration than anything else. My plan when I arrived was to stay a couple of nights in Beirut and then cross the border of Syria on the Beirut-Damascus Road. The first day I was here the road was closed due to riots and then yesterday there were more demonstrations following a speech by the leader of Hezbollah. Overall though, the situation remains peaceful as both sides have seemingly transitioned democratically. The U.S. has had some strong statements against what has gone on here in Lebanon, even though everything was done within the constitution and through the democratic process. It is frustrating the Lebanese to hear the U.S. is reconsidering it’s economic ties. It is interesting to see the situation from this side as I get a unique perspective. I went to the Syrian embassy to try to get a visa to travel overland to Damascus but was told there is a 1 month waiting period for American citizens. My second option is to attempt the land crossing with out the pre-arranged visa in hand. In normal circumstances the odds of an American getting through at the land border are about 50/50. The current elected Prime Minister is backed by Syrians so the U.S. response has not been taken well throughout the region. This means, the likelihood of me getting through is very low. There is nothing dangerous about trying though. At worst I lose a half a day. The Beirut-Damascus road is about 3 hours. I will likely be turned around at the border and told to go back to Beirut. If this happens I’ll visit a few more sights in Lebanon and then move on to Jordan by plane. Keep reading to see if my cunning plan works! I had been keeping a close eye on the situation brewing in Lebanon for a few nights while still in Hargeisa. The news about the popular uprising in Tunisia had stolen most of the headlines but I would occasionally catch a glimpse about Lebanon’s political turmoil. I had two choices. Fly to Beirut and attempt my overland Middle East journey or fly to Cairo and be South East Asia-bound much sooner than expected. It looks like it didn’t matter what choice I made because Tunisia has seemingly lit a fire of revolt in the Arab world that is making travel just a little bit more concerning. The situation in Lebanon is complicated and unrelated to Tunisia and Egypt, but I’ll share what I’ve gathered so far. Constitutionally, the Lebanese government is power shared. This means that the President must be Christian, the Prime Minister, Sunni Muslim and the Speaker of Parliament must be a Shi’a Muslim. The population of Lebanon is split at about a third between the three religious sects. Hezbollah, who the U.S. and Israel consider a terrorist organization, ceased power a couple of weeks ago and Lebanon has been in a sort of limbo since. I arrived in Beirut at about 9pm on Monday night. The taxi driver updated me on the current situation and said that things were still tense. He asked me what I was doing in Lebanon and I told him, tourism. He replied, “Now? Huh.” He said to be aware that things can change by the minute and that the road to the airport opens and closes at random intervals. 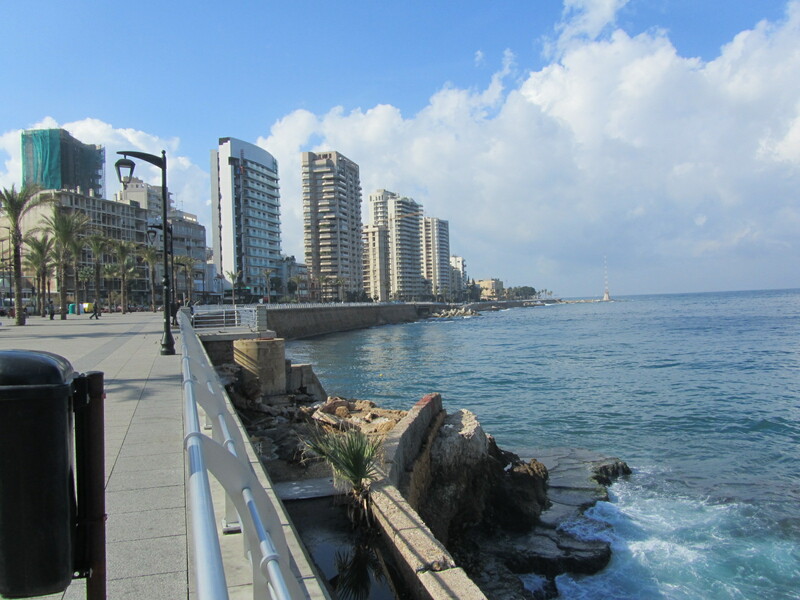 When I got to Beirut, there was no government. I have to say my first night in Beirut was intense. I have been around the world and on some adventures but have never had the adrenaline pumping like when I arrived here. The driver pointed out the Islamic quarters and the Palestinian encampments and said as long as I avoid these areas I should be fine. I woke up the next morning to the news that the new Hezbollah-backed Prime Minister was elected and the opposition called for a “Day of Rage.” I decided it might be best to hang low and check up on the news online. An Italian NGO worker staying in the dorm with me has been a big help on getting information. His embassy has been in contact with him to update him on road closures, demonstrations and just about any information that might be important. 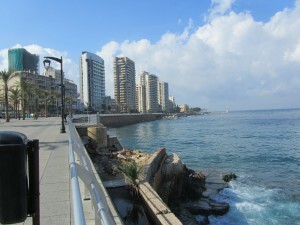 The U.S. embassy also urged citizens in Lebanon to take precautions. The news I was reading online through multiple sources, including: CNN, Al Jazeera (English) and BBC World News, all seemed to show a different story than what was happening. If you paid attention to headlines and saw glimpses of the situation on the world news, you would think that the entire city was in crisis mode. It is true that the situation remains tense but the demonstrations that did happen were peaceful as both Hezbollah and the Western-backed opposition called for peace in the streets. There were hand grenade attacks on the media in some towns outside of Beirut but in the city itself there were merely peaceful demonstrations and tires being burned in the street which seems to be more symbolic than to create problems. There are daily demonstrations scheduled for Martyr’s Square which is only about 100 yards from where I am now but I haven’t heard or seen anything alarming. The army and police presence in Beirut has increased. It is not surprising given the history of Lebanon. It is quite a common sight to see tanks and trucks full of soldiers driving through the city. I’m in a very safe area of Beirut right now. Even if things start to get ugly (which is starting to look unlikely) I will be well protected. There is a big difference from last night and tonight with the amount of people who are out doing things. I’m staying in a neighborhood called Gemmayze, which has been nicknamed the Greenwich Village of Beirut. It is an upscale area with lots of pubs and fancy restaurants. It’s also the “Christian Orthodox” section of Beirut as the city is divided into many parts. If you’re following along this blog and have considered heading to Somaliland, it is likely your exit strategy might consist of the following. Since I didn’t want to backtrack to Ethiopia and deal with getting another visa, my only option was to fly out. There are limited options from both Hargeisa and Berbera. I chose the earliest flight to the United Arab Emirates via the city of Sharjah. Also, I’m not done writing about Somaliland I just figured I don’t want to get too far behind on my everyday happenings. Flights on the low cost African airlines such as African Express, Jubba and Daallo all fly into Sharjah International Airport which is about 45 minutes outside of Dubai. I arrived in the evening around 5:30pm as the sun was setting. I had no hotel and no arrangements made for transportation. I just figured, inshallah, I’d find my way. I had all the time in the world as my connection out of Dubai International Airport won’t be until 6:30pm the following night. I asked a few taxi drivers for the price to get to Dubai Intl. and they all said about 85 AED which amounts to $22. I wasn’t going to let Dubai start draining my wallet that quickly so I searched for other options. I asked several bus drivers and each gave me a different story. “Take the 99 bus to the fish market and change to the airport,” the first guy said. “Take the 88 to Rolla Square and then change to the airport”, the second one said. I only got on the 99 bus because it was the next one leaving. I paid 5 dirham and waited for a fish market. After several stops we arrived at a central bus station and since I never saw a fish market I decided to get off here. I went to another ticket window and asked how I could get to the airport. The guy at the window was really friendly and wanted to know where I was from after a few wrong guesses. First, Arab? Second, Italian? No, I’m American. “Oh, American! Welcome! Welcome!” I thanked him and got on the suggested 5 dirham E301 bus from the main bus station and got off at the last stop, Rashidiya. From here I would need a 12 dirham taxi fare to terminal 1 at Dubai International. When coming out of Rashidiya, be careful of fake taxis attempting to take you. I had a guy offer me a cheaper price but he wanted me to get into his jeep. Taxis in Dubai are clearly marked and offer a meter to avoid getting ripped off. I’m sure the faux cab was legit enough but I wasn’t about to take my chances. 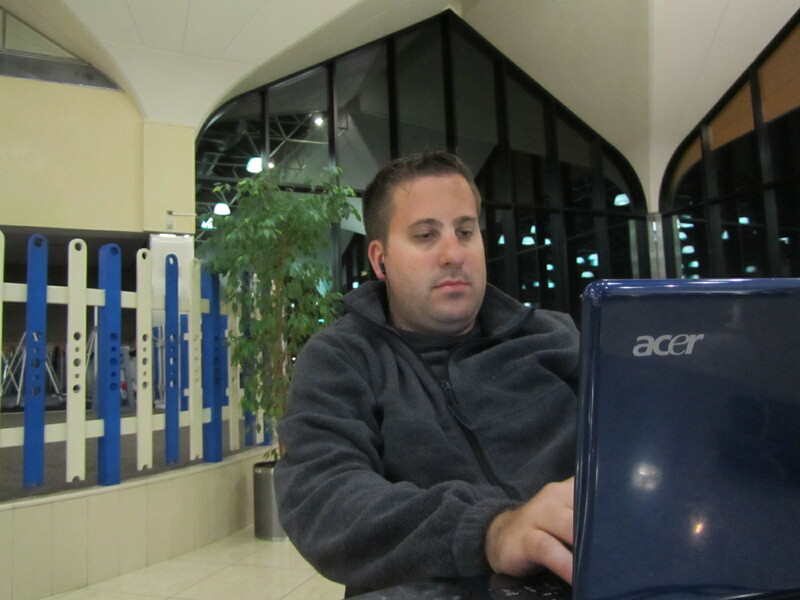 After a total of 24 dirham ($7) I was at the airport. This was three times cheaper than the taxi fare and even though it took awhile, I felt pretty good. Every traveler has done this at least once in their lifetime. It is a sort of right of passage. 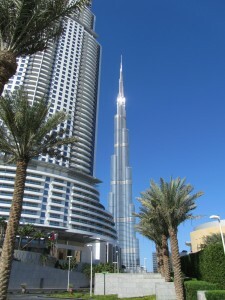 Dubai is an incredibly expensive city to sleep in, especially on a backpacker’s budget. I checked a few hotels nearby but they were all booked. I was willing to spend up to $75 but even that was pushing it. I opted instead to make home in the land-side of Terminal 1. Terminal 2 is the one I’m supposed to be at but there are more facilities at this one. After a few hours of hanging out online in the food court I found a bench in a quiet area and slept for 3 hours. I won’t pretend to know everything about Dubai based on a few hours outside of the airport checking things out. I went to the metro station and bought myself a ticket to the Burj Khalifa stop so I could check out the tallest building in the world. It turns out an immediate pass to the top of the building would cost me $100. After saving money on sleeping in the airport, I wan’t about to blow it here. I figured it would be a nice view but nothing I couldn’t miss. Instead, I walked around the Dubai Mall for a few hours. Dubai is truly an international city. There isn’t much Arab about the new city at least. Most of the service industry workers are Filipinos and Indians. I feel like I came across more westerners walking around the city today than anything else. The city reminds me of a cross between New York and Miami. It is appealing to the eye of course but at the same time there is something missing that I can’t quite put my finger on. The mall had all sorts of comforts from home. Coldstone Ice Cream, Macaroni Grill, Chilis, Taco Bell. Do you think I stopped through here with out a “Like it!” scoop of Cookie Doughn’t You Want Some? and a couple soft tacos? Hey, I’m an opportunistic eater. I figure I will have plenty of authentic Middle Eastern food in Lebanon. In less than 24 hours I broke the law four times in Dubai and was fined once. When I first got on the bus I sat down in the front seat and didn’t see the sign that said “Women and families only.” Fair enough, the bus driver told me to please move. Strike one. The second bus I got on, I made the exact same mistake. The sign happened to be in a different spot so I figured all was good. I was given a stern warning and told to move to the back. Strike two. When I was getting on the metro to head to the city center I put on my headphones and jammed out to music. I happened to get into the second car to the front of the train but after the first stop noticed less people in the front and wanted to get a better spot. Several women were looking at me. I thought, OK Dubai is cool, the women like to look at me. The train is a little slower to move this time and out from the control station in the front a women comes barging towards me. I take off my headphones and she says, “Please, this car is for women and children only!” You’ve got to be kidding me! I think to myself. I apologized sincerely and told myself, from now on, in the Middle East, I will read every sign before entering a room. Strike three. At this point, there isn’t more damage I can do in Dubai, is there? My ignorant self couldn’t possible do anything else in such a short time. So I go to the ticket station and I purchase the leg back to the airport. 4 dirham. It was slightly less than my trip there but I thought nothing of it. I arrived at Terminal 1 and pulled my card to swipe my way out of the train station. I was met with a BUZZ. Invalid card, short term transfer exceeded. I was pulled off to the side, told I needed to pay a 6 dirham fine and would have to purchase a new ticket. A police officer came to me and warned me that if I were caught on the train with a ticket that was invalid that I could received a fine of up to $50. I once again apologized for my ignorance and continued on. Now I’m back in the airport where I seem to be OK. I haven’t made any mistakes here yet and can only hope to keep it that way. My flight to Beirut, Lebanon leaves in 5 hours. I’ll head over to Terminal 2 shortly. None of the hostels I’ve sent reservation requests to have replied with confirmation. I sure could use a shower. If I can’t get anything confirmed I may end up splurging my first night to get all my laundry done and a nice hot shower to start my Middle East journey.